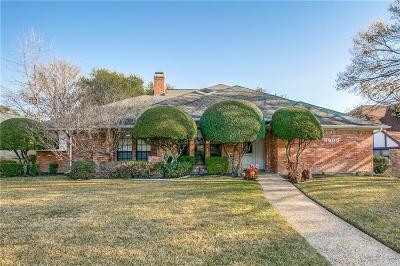 Great home located in highly sought after Plano neighborhood. Large living area features picture framed wood paneling walls, coffered ceilings, atrium & double sided fireplace that opens up to the game room or flex space with full wet bar & wainscoting. The kitchen has an ample amount of storage with large kitchen nook, formal dining room. Spacious master bedroom with large walkin closet & ensuite bath recently updated with new counters, fixtures & flooring. 2 secondary bedrooms with updated bathroom and shower. Relax under the covered patio that looks over the landscaped backyard ideal for outdoor entertaining. Engineered hardwoods throughout and fresh paint! Close to shopping and restaurants! New roof 2016.